Summing might not sound very 'rock & roll', but Thermionic Culture have added a little attitude of their own to this impressive and unique design. Thermionic Culture are British 'boutique' manufacturers of high‑end valve audio equipment, including compressors, mic preamps, distortion units, equalisers and summing mixers (most of which have been reviewed in SOS). The designer, Vic Keary, has been developing and building this kind of equipment, initially for his own studios, since the '50s, and you can read about his fascinating life in SOS June 2004 (/sos/jun04/articles/vickeary.htm). Introduced first in 2007 but developed further since then (with additional inputs and other facilities), one of the stars of the product line is the Fat Bustard. This is essentially a passive, 12‑channel summing amp, organised as four stereo pairs and four pannable mono channels, plus two aux inputs for reverb returns or integration with the Little Bustard 16‑channel summing mixer, which can be used as an input expander. The gain make‑up and output stages are a little unusual, but the Fat Bustard also adds facilities that make it much more than a simple summing mixer, including variable 'attitude' distortion, stereo EQ, and frequency‑conscious stereo‑width controls. The rear panel carries two rows of eight XLR sockets to accommodate the four stereo inputs, four mono inputs, two aux inputs and two outputs. However, these are actually all wired as unbalanced connections (signal on pin 2, pins 1 and 3 grounded) because the designer felt that the unit sounded better in that configuration. Other Thermionic Culture products have unbalanced I/O too, for the same reasons. To the left‑hand side is a standard fused IEC mains inlet socket and mains-voltage selector switch. The Fat Bustard is well named, because it's an enormous product, occupying 4U of rack height, although it doesn't weigh anything like as much as you might think. 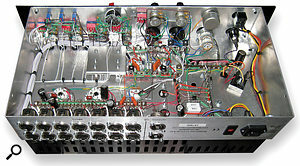 The internal construction is to a very high standard, using traditional valve circuit construction techniques, with components mounted on tag strips and the valve bases, with very neat hand-wiring throughout. A peek at the interior of the Fat Bustard shows the high quality of both the components and the assembly. The front panel is crowded with large, black, vintage‑styled knobs and coloured toggle switches, which all help to give the impression of something from a Cold War rocket‑silo control room. The shiny black front panel is printed with clear, white legends, and although the panel is very busy it's very straightforward to find your way around. Arranged across the top are the level controls for the four stereo input channels, each with an associated red mute toggle switch. The rotary controls have a gentle, detented action and are calibrated in decibels, from zero down to minus infinity, with the top‑centre being around ‑10dB. The rotary controls on the next row handle the four mono input channels, with the same detented action, attenuation scaling and mute switches, but below these are four smaller rotary controls, which enable these mono signals to be panned across the stereo outputs (again using the same detented action). A further toggle switch labelled 'mono/pan' activates the pan control for each channel, but if left in the mono position the signal is routed equally to both outputs, with 3dB of additional gain. Down in the bottom left‑hand corner, three more toggle switches activate the two fixed-level auxiliary inputs. Normally Aux 1 feeds the left output channel and Aux 2 feeds the right, but the third toggle (Aux to Centre) forces both to feed both outputs in centred mono. Moving back up to the top of the control panel again, to the right of the stereo input controls is the EQ section, which is based on Thermionic's 'varislope' passive EQ designs. Two detented rotary controls provide bass lift and top lift, each with a toggle switch to bypass them independently. The bass lift provides up to about 11dB of boost building gradually from 2kHz downwards, and peaking at 50Hz, while the top lift rises above 800Hz, peaking at 10kHz, with up to around 12dB of boost. The bass‑ and top‑cut sections are six‑position rotary switches, again with independent bypass toggles. The first three positions of the bass‑cut provide gentle 6dB/octave high‑pass filter responses, with progressively higher turnover frequencies, while the last three introduce a shelf response, again with progressively higher turnovers. The choice of frequencies has been chosen cleverly, so that the bass‑lift and bass‑cut controls can be used creatively in combination to provide some mid-range scooping. The top‑cut control is organised in a very similar way, with the first three positions providing first-order low‑pass filter slopes, removing more of the high end as the switch is advanced, followed by a shelving response across the last three positions. Completing the panel to the right of the EQ section controls, Thermionic's standard large, square VU meters indicate the stereo output signal levels. Below the EQ controls are two four‑way rotary switches and two more rotary controls, which together comprise the stereo‑width facilities — and these have been based on the kind of 'elliptic equaliser' facilities developed originally for vinyl cutting lathes. The first rotary switch (Spread Filter) determines the frequency range that is affected, with options for all frequencies, or only those above 100, 250 and 3000Hz, respectively. Having selected the appropriate frequency range, increasing the smooth‑action 'Stereo Spread' control will expand the stereo image, with the maximum setting being quite extreme! Another toggle switch provides a section bypass. The rear panel hosts the XLR inputs, aux and output sockets, as well as a switchable power inlet capable of working at a generously broad range of voltages around the US and EU/UK mains standards.The 'Bass to Centre' rotary switch does exactly what it says: it narrows the stereo width of the lowest frequencies (something that was often necessary when trying to cut loud, playable records). The same facility helps to improve the solidity and weight at the bottom end of all recordings, and the switch determines the range of LF affected, with options for none, signals below 100 or 200Hz, and everything to mono. The final control in this section is an overall balance control to fine‑tune the centre balance. Surprisingly, this doesn't have a detented action and finding the accurate centre balance requires some attention. To the left of the stereo‑width controls, and nestled between those and the aux input switches, is a large, red, chicken-head rotary switch labelled 'Attitude.' This feature has been borrowed (and slightly tamed) from Thermionic's Rooster preamp — which was, itself, derived from the Culture Vulture specialist distortion unit. Essentially, this control allows a progressive amount of classic, mostly second‑harmonic tube grunge and distortion to be introduced, to flavour the sound character in any way desired. At the lowest setting it has a minimal effect, but as the control is advanced it reduces the amount of negative feedback, so the gain rises (to a maximum of about +15dB) and with it the amount of distortion increases. The high‑frequency character changes noticeably too. Finally, the area below the two VU meters is dominated by a large Elma rotary output‑level control switch, scaled from unity gain down to minus infinity, with ‑9dB at the top centre. Next to that is the traditional chunky power on‑off toggle switch and large green power‑lamp bezel. Thermionic's equipment is always interesting and unusual, and while it's inherently quite specialised, there are sonic qualities on offer here that are very hard to find elsewhere. The Fat Bustard is certainly very well made, and it feels solid and reliable in use — which is a welcome step up from some of the very early Thermionic Culture products I reviewed, which weren't always finished to the high standards of the current models. The technical specifications are very good for a valve device, although the figures may look poor in comparison to current state‑of‑the‑art solid-state products — but figures don't tell the whole story, of course, and sometimes the sheer sonic quality justifies the end results. In the case of the Fat Bustard, the input impedance is a little low, at 8kΩ (although this varies with input‑gain settings on each channel), but I doubt many sources will have a problem with that. The unbalanced nature of the I/O may cause some ground‑loop issues in systems that have dubious earthing, but I had no problems at all during the review period. With a signal‑to‑noise ratio of 100dB (A-weighted), it would pay to drive this unit fairly hard (it can drive output levels up to +26dBu) but most D‑A converters are aligned for peak levels close to that anyway, and the Fat Bustard is going to be used mostly on traditional loud rock & roll material rather than delicate classical works, so there shouldn't be any noise problems in most applications. Distortion is part of the raison d'être of this product (as it is with the entire Thermionic Culture product range, really), but at the lowest Attitude setting the tech specs quote 0.015 percent, which is pretty clean in the grand scheme of things. The total distortion at the highest setting isn't given, but at 'Attitude 3' it rises to 0.22 percent, which gives an idea of how progressive that control is. The frequency response varies with the Attitude control as well (especially at the high end), but at the lowest setting the bandwidth encompasses a very respectable 9Hz to 30kHz (±0.5dB). I hooked up the Fat Bustard to remix some big‑band material I'd recorded on a Genex eight‑track hard disk recorder many years ago, because it was a very quick and convenient multitrack source with high-level analogue outputs. Active mixing on rotary controls (while the only way to work 60 years ago and still in use in some areas when I joined the BBC over 20 years back!) is clearly not ideal, but it is certainly possible, as I managed to prove, and I was able to generate some very pleasing mixes, with a full‑bodied and involving sound. In general, though, I suspect that most users would generally configure the Bustard with static levels and rely on DAW automation for most delicate internal balancing requirements. The master output's equalisation and stereo‑spread controls are quite wonderful, although the EQ operation is not as intuitive as it first appears, because of the way the controls interact: it took some playing around before I achieved the required results the first time, but more familiarity and understanding led to faster operation, and the sound shaping was always sublime. Adding some spread above 3kHz brought out the spaciousness of the concert hall in a lovely way, and these controls were very logical to operate. It's possible to enhance the 'side' signal quite substantially with the spread control, which could easily lead to mono compatibility problems in some situations, so it would be worth making mono checks and/or keeping an eye on a phase correlation meter when making adjustments, especially when using the wider bandwidth options. Loading in new disks with varying combinations of mono and stereo mix stems of various large‑studio recording projects (safety copies from years gone by) provided a more representative situation for the Bustard, as these stems were mostly designed to produce the correct final mix when combined at unity levels — and indeed they did. The ability to mute unused inputs is useful, and for the uber‑critical it improves the noise performance too. Since this was far more 'rock & roll' material, the application of the Attitude control was also rather more appropriate. I did try it with the big band tracks, but it wasn't a quality that really worked well in that context, as I found it tended to destroy the clarity and focus of the lead brass instruments. However, with this new material it really did work in an interesting and generally beneficial way. The low settings introduced some welcome body and an impression of a richness into the relatively sterile mixes. Regular readers will know that my personal preferences in all things audio generally tend towards accurate and neutral, so won't be surprised that I found no real use for the higher Attitude settings, which can grunge the sound up pretty well — especially on harmonically complex source material — but I can certainly see applications for this kind of processing on individual sources, or even certain mix components, such as drum stems. For me, though, the higher settings impose too much of a dominating character on complete mixes — even though this is a deliberately tamed version of the Attitude control than that found on the Rooster. The lower settings (up to 3, or 4 at a pinch) I found quite successful and positive... but I dare say there are plenty of mix engineers who will enjoy far more than me the way the Attitude control colours and attacks their material with the top few settings too! Despite being a stepped attenuator, the master output control can be used to provide fade-outs perfectly successfully, if required, and it is obviously very useful in dragging a high mix level down to something that sits in a more comfortable range. 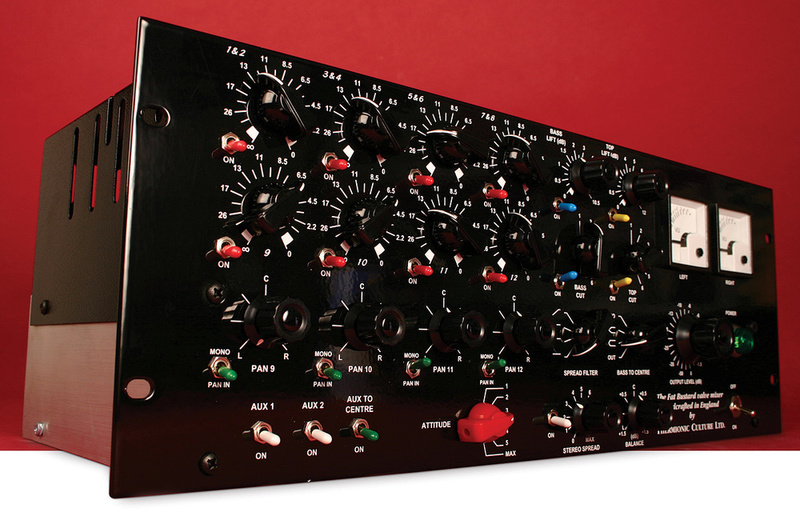 The Fat Bustard is one of the more expensive summing mixers on the market at the moment. However, the sheer sound quality of the passive mixing, along with classic passive EQ facilities, unusual valve gain-stages and stereo‑width facilities make this one of the most versatile sonically, and it adds in a large helping of mastering‑style features 'for free'. This is an unusual product, and that, combined with its distinctive sound character, build quality, and sheer presence in the rack make it well worth serious consideration if you're looking to invest in this area of the market. Most valve summing mixers are actually hybrid designs, like the Manley 16x2 or the TL Audio Tubetrackers, and work on the basis that combining solid‑state electronics with tube output stages provides the best of both worlds, both technically and sonically. 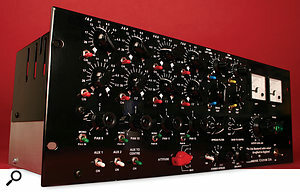 Thermionic Culture's Little Bustard is probably the most directly comparable product from a technology point of view, and it is significantly less expensive, even though it provides 16 inputs (six stereo, four panned mono), as it uses more familiar valves and lacks the signal-processing features of its bigger sibling. Alternative esoteric summing‑mixer options include the Chandler Mini‑Rack, or the Roll Music Folcrum, which is a simple 16-input passive mixer without gain stage — the idea being that you can partner it with a stereo preamp of your own choice, including quirky stereo valve preamps if that's the character you require. Vic Kearney certainly isn't a man who follows conventions when he designs his products. He likes to combine proven good ideas with his own off‑the‑wall inventions and use them to produce something that is better than the sum of its parts. The Fat Bustard continues that theme in its unusual choice of valves. For example, the main summing amp in each channel uses half of a 5965 double‑triode valve, which also drives the passive equaliser stage, while the second half provides more make‑up gain in concert with the Attitude feedback control, to provide variable distortion characteristics. This tube design has been used relatively rarely in audio applications (although Fairchild used them at one time, and they were used in the front end of some hi‑fi preamps too) and I've only come across them used as electronic switches before, in early digital logic systems and 'computers'. Vic chose the 5965 for the Fat Bustard to give a smooth, fat character to the sound, and it seems to have been a wise choice. Each output stage is based around a 6SN7 valve, which is another double triode, but it's a chunky one, and the two halves are connected in parallel to maximise the operating headroom and deliver a clean, punchy sound character. A third valve type is also employed — and this time it's the far more familiar 12AU7 (yet another double triode), to operate the stereo‑width control functionality. Classic Thermionic Culture sound character. Slightly noisier than solid-state summing amps. This 14‑input passive summing amp is impressive in its combination of classic summing-amp and mastering-style facilities, as well as Thermionic's 'Attitude' variable distortion characteristics.